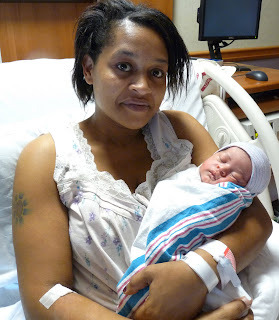 Speaking of rescue squads (I was really, two posts ago), Christine Shellington is grateful to the Catlett Rescue Squad for delivering her to Fauquier Hospital so she could deliver her eighth child. Christine arrived at Fauquier Hospital at about 7 a.m. and gave birth at 10:13 Saturday morning to Brianna Christine Raymond, 7 pounds, 5 ounces. Brianna has been a quiet baby so far. She only cries when the phone rings. For now, Christine is enjoying the quiet in the hospital. With seven children, all under 12, at home, she could use the rest. “I call them about every hour or so. They’re playing Wii,” she said.